This copy of the Fourth Folio, published in 1685, is the first Shakespeare Folio to be added to the Folger Shakespeare Library collection since the days of our founders, Henry Folger (1857-1930) and Emily Folger (1858-1936). The collection now holds 38 copies of this last of the four great printings of Shakespeare’s collected plays during the 17th century. The Fourth Folio would also be the basis for the majority of 18th-century “modern” editions. Although the publishers of the Fourth Folio often seem focused on speed rather than accuracy or aesthetics, the owners of this particular Fourth Folio, the Francis family, nevertheless treasured their book for almost 200 years. Philip Francis (1708–73), a well-educated Anglo-Irish clergyman and a friend of the prominent Shakespearean actor David Garrick, filled the book with more than 2,000 annotations, including many comparisons with other editions from his time. 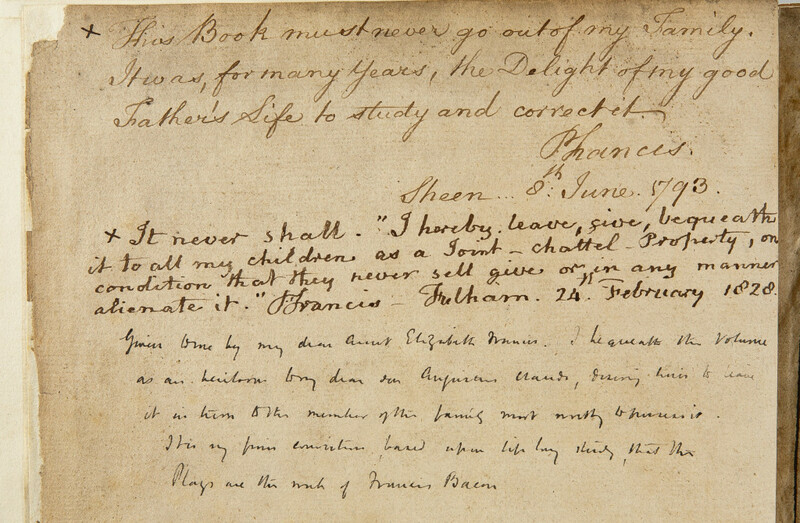 As his son later wrote, “[t]his book must never go out of my family / it was for many years, the delight of my good / father’s life to study and correct it […]”. This blog post is adapted from a blog post by Caroline Duroselle-Melish on The Collation. A version of this post also appeared in the Fall 2015 issue of Folger Magazine. Caroline Duroselle-Melish is Andrew W. Mellon Curator of Early Modern Books and Prints at the Folger Shakespeare Library.